Home / News / Tej Singh win by TKO in the 4th over Jason Leuken. Tej Singh wins by TKO in the 4th over Jason Leuken. 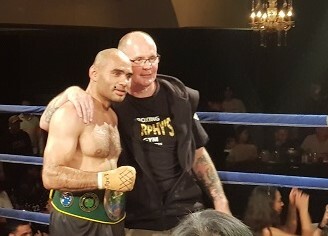 Tej Singh and Jason Leukens fought for the vacant Australian Middleweight Title at Melbourne Pavillion on Friday 14th December. The fight began with two tough rounds between the competitors. Singh was the greater aggressor with Leukens on the back foot delivering some well timed counter punches. The bout then convincingly turned in Singh’s favour in the third round with Leukens being increasingly slowed by Singh’s persistent shots as the round wore on. The fourth round unfolded with Singh continuing to press and hurt Leukens who was twice down for the count before his corner threw in the towel 2 minutes and 11 seconds in.